The 4700 Sport Yacht is above else a robust, reliable and brilliantly engineered vessel. It is a boat in which you can have supreme confidence. The running surface of the hull has been designed by esteemed international naval architect Frank Mulder and features tunnels that house the propellers, an ingenious design that provides more forward thrust, superior fuel efficiency and a wonderfully stable ride. Although our Sport Yachts reflect the solid character and stable ride of our world-famous Flybridge Convertibles, they also incorporated the spirited performance of our Sports Cruisers. 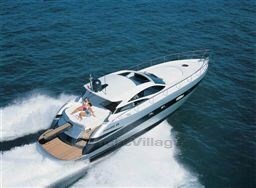 The 4700 Sport Yacht is as nimble and exhilarating as it is sure and steady. It is a boat designed to give you the best of both worlds. This toillet 4700 SY has only been used, by her first and only owner for daily use. Boat now available from September 2018. Call for further details. Commission fees to be paid also from the Buyer. 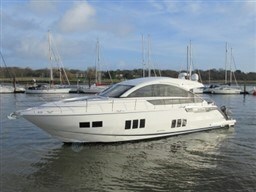 Dear Sirs, I have seen on YachtVillage your offer about Riviera Marine 4700 Sport Yacht - 2008 (code: 23530). I am interested in the offer and would like you to contact me. Thank you.